Warm Plum Lipstick and Blackberry Sparkle Lip Gloss. This luxurious formulation is appropriate for all skin types and can be applied with the fingers or a sponge. With the color wheel as our guide, we designed this broad range of shades to compliment all skin tones. 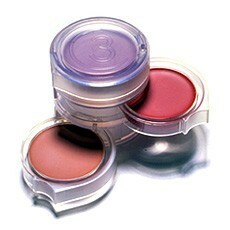 Coming soon - our Creme to Powder Blushes will also be available in refills for your Refillable Trio Compact! Plum Blush - A rich full-bodied plum that gives a lovely glow to medium to deep skin tones.